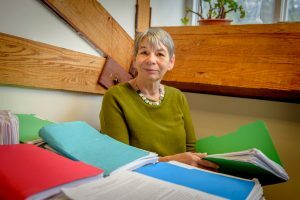 There’s little doubt in the mind of public health researcher Jane Ungemack that keeping children with their parents – and out of the child welfare system – gives them the best chance of success in life. With evidence from two decades of research collaboration with state agencies and community-based organizations, the bigger question for her is, what’s the best way to do it? Connecticut recently started a six-year study of Family-Based Recovery, a method of intervention for parents who need substance abuse treatment that has been shown to reduce both the substance abuse and the chances of children having to be removed from their homes. That may be the answer, and it is Ungemack’s job to analyze its effectiveness. The Family Stability Project will conduct a randomized control trial with 1,000 families to determine the effectiveness of Family-Based Recovery compared to standard services in keeping children in their home. The intended families are those with children up to age 6, who are involved with the Department of Children and Families, and who have a parent with a substance abuse disorder. Family-Based Recovery teams – consisting of two clinicians, a substance abuse specialist, and a family support worker – will make regular visits to provide intensive in-home treatment that focuses on parent-child attachment and substance abuse recovery. As the independent evaluator of the Family Stability Project, Ungemack will compare outcomes of those families in the Family-Based Recovery group to those receiving standard service options. She will measure success based on carefully defined metrics, including prevention of out-of-home placements, prevention of re-referrals to DCF, and reduction of parental substance abuse. Adding to the importance of Ungemack’s evaluation is the fact that the results will have a direct correlation to the expenses the state will incur to run the program. This is Connecticut’s first “Pay for Success” project, a relatively new concept in which private investors, not the government, provide the initial funding for social programs. The government gradually repays the investors, but only if the program achieves success as quantified by the metrics. Repayment of the original principal – in this case more than $11.2 million – plus a modest return would require significant outcomes across all metrics. If no positive outcomes are achieved, the government makes no payments. This approach is also known as social impact bonding. DCF says parental substance use is a factor in more than half the cases it investigates, and that the family-based recovery approach has a track record of success in reducing the agency’s involvement and in keeping families together. While DCF has supported Family-Based Recovery services for nearly seven years, Ungemack’s evaluation will help determine if this approach is worth the expense. A high rate of repayment of these social impact bonds would mean the program is indeed successful. At that point, the expense incurred by the state could be weighed against the savings from an associated reduction in health care, child welfare, criminal justice, and special education costs, as well as productivity losses.